Most Christians assume they automatically qualify to escape the Great Tribulation by a “pretrib rapture.” But if that’s so, then who are the believers that the Antichrist beheads? Find out why God’s end times escape plan will require something few Christians have: sacrifice and faith. Learn how to fix that, be ready for the end times and escape it with God’s help. Is the birth of a “red heifer” a sign or even an end time prerequisite? The Book of Numbers says that the ashes of a red heifer are required for the cleansing of the Levitical priesthood for Temple service. Given the prophecies about an end time Temple that needs cleansed priests, some Christians therefore herald each birth of a red heifer as an end time sign or precursor to the Third Temple and its altar. Find out what those saying this may be overlooking and also the surprising fine print about the 2018 red cow. Most Christians assume they automatically qualify to escape the Great Tribulation by a “pretrib rapture.” But if that’s so, then why did Jesus command us to “pray for the strength to escape…and stand” as if escaping takes, not mere belief, but faith and action? Find out how God’s end times escape plan will indeed require something few Christians have: unwavering mental strength to obey in the face of adversity. Identify which of ten areas you are vulnerable in now so you can start working on them. This is the only way to not give in to pressure and disobey God’s difficult escape command in the end times like Lot’s wife did. I would guess you’re not exactly “thrilled” about the end times. Frankly, you may be among those terrified by it. If so, then you’ve come to the right place to find relief and comfort. I’ve prepared this article to help readers work through their most common end times-related fears. 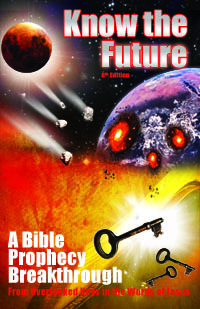 You’ll learn you’re not alone—even believers in a “pretrib rapture” fear the end times. Find out what underpins most of these fears so you can defuse them. Through that and some articles linked here, you can replace your fear with comfort in the future like so many of my readers report. Does God Curse Those Who Curse Israel Today? Is an ancient covenant God made with Abraham 4000 years ago resulting in blessing or cursing on modern nations when they interact with the State of Israel? Does God curse nations for cursing Israel like United Nations anti-Israel resolutions do? Learn the problems with this prophecy theory and what to look for when it comes to curses of God. Tyler on Why Jesus Can’t Come Back in 2019—or Even Before 2030! (At Least)The devil and his demons are allowed to make us sick.